WHEN THE MUSIC'S OVER Haneke’s latest follows a pair of retired piano teachers as they face their final days together. 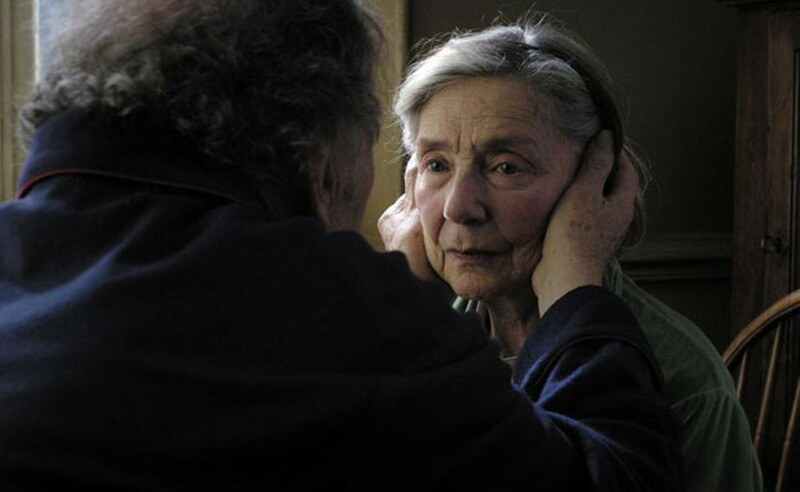 Whether or not Michael Haneke’s unflinching new movie takes home any of the five Oscars for which it’s been nominated, there’s one distinction it totally has in the bag: Amour is hands down, far and away the feel-bad film of the year. Of the decade, for that matter. The century. Quite possibly of all time. This is one brilliantly made bummer. Even the casting is pure genius. The final chapter in the love story of an elderly Parisian couple, the picture stars Jean-Louis Trintignant and Emmanuelle Riva. Seeing these actors now, in their eighties, is particularly poignant because we remember them so vividly in their youthful prime. He’s best known for A Man and a Woman (1966), she for Hiroshima Mon Amour (1959). They’ve been legends of French cinema for half a century. In an early scene, their characters, Georges and Anne, return to their apartment after attending a piano concert to find that someone has tried to break in. The lock on the door is damaged, but nothing appears to have been stolen. It’s a subtle bit of foreshadowing on the part of the Austrian writer-director. In the morning, the pair will realize how irrevocably they’ve been robbed. As he shares breakfast with his wife, Georges is alarmed to discover she has suddenly lost the ability to respond. He waves his hands in front of her face, but she gazes blankly. When Anne comes to just as suddenly, she has no memory of the episode. Things go from weird to worse when doctors find a blockage in an artery and then botch the operation that’s supposed to remedy it. Far from improving things, the surgery leaves Anne paralyzed on one side, no longer able to walk. And, in additional insult to injury, she’s unable to play the piano. Both Anne and Georges are retired musicians. Records line the walls of their living room. Stacks of stereo equipment and a grand piano testify to lives lived as citizens of the cultural world. The filmmaker is sentiment free in his study of Anne’s reaction: When Georges plays a new CD for her, she tells him to turn it off. Art, Haneke seems to suggest, is ultimately a luxury, a frill rendered irrelevant by sickness and death. Amour is filled with brutal truths like that. If it isn’t the only movie ever made about how physical shutdown looks and feels, it’s certainly the most honest. Anne’s condition deteriorates to the point where she can neither walk nor talk. Georges is instructed in the proper method of putting adult diapers on her and where to apply creams to prevent bedsores. As we watch him wash Anne’s hair in the bathroom, we realize we’re witnessing an expression of deep devotion, one of the final physical acts of love this man and woman will be permitted to share. If you know Haneke’s work — meticulously composed ruminations on human nature such as The White Ribbon, The Piano Teacher and Caché — you know that uncontrollable impulses and violence often lurk beneath the surface of even the most civilized situations in his films. That is the case behind the closed doors of this well-appointed Paris apartment. Sometimes love means having to say you’ve never been more sorry. The performances by both leads are devastating, Haneke’s direction is masterful and imaginative, and his screenplay a thing of terrible beauty. On Golden Pond this is not. The furthest thing from sweet sorrow imaginable, Amour gets real about the pain of parting in every sense of the word. * Running time: 127 min. Rick Kisonak is a film reviewer for Seven Days.